On 13 April 2001, the Association of Child Survivors in Germany (Child Survivors Deutschland, CSD) was established, nearly fifty-five years after the end of the Holocaust. The group, initially modest in its aims, soon became an invaluable new organization, which served as a kind of “surrogate family,” for many survivors. It offered them a retreat, as well as much needed social and emotional support. Survivors could provide each other with a common understanding of their shared experiences. Yet in the years since the establishment of this group, the rise of far right-wing extremists and the mainstream acceptance of nationalistic political policies has become a cause for serious concern. As a result, the CSD has attempted to move from an inward focused support group, to a more active socio-political organization, which aims to make its voice heard to the broader German public. Increasingly, we have attempted to establish this voice through the launch of our website (http://www.child-survivors-deutschland.de/), and through public speaking engagements, particularly aimed at younger students. Most significantly, the CSD has published eight volumes of a two-part ongoing series, which examines the experiences of Holocaust survivors from liberation up to the present day. It is the aim of this article to summarize these publications for the reader and present an overview of the general themes that underpin this series. The CSD’s focus on memory of the Holocaust begs the question, “are we mired in the past?” In other words, “are we, as child survivors, ‘stuck’ in our childhood?” The answer to these questions could simply be no; however, as child survivors of the Holocaust, our lives remain forever influenced by the experiences of the past. Though many of us are over eighty years old, we remain alert, active, full of vitality, and keenly aware of our current challenges. While this alertness in some ways staves off the enervation of old age, it can, at times, manifest in negative ways. The fear of an impending catastrophe, or the inability to come to terms with the past, can prove an exhausting and frustrating experience. Stretching this feeling over several decades can lead many survivors to feel extreme bitterness and dissatisfaction with the responses of society. Fortunately, in recent years the situation has improved. Survivors have gained more respect and recognition in the past few decades, and our stories are now welcomed. We present at schools, speak about the Holocaust to wider public audiences, and are valued as witnesses to one of the worst atrocities in history. Though this shift is significant, the impact of survivors’ stories and experiences can go still further. The CSD’s new book series attempts to introduce a broader audience to the little-known challenges faced by survivors, and the complexities of survivor identity. Though we share the common experience of the Holocaust, our individual fates are remarkably different. Within our group there are dissenting opinions on such topics as the definition of ‘Jewish life,’ the nature of antisemitism, and the state of Israel. Additionally, after the Holocaust, child survivors faced mental health problems, which made them feel apart from “normal” society. This has subsequently resulted in a heightened sensitivity to shifts in mainstream politics, and a particular awareness of the rise of the far-right. As this two-part, multi-volume book series will explore, even typical day-to-day occurrences can trigger extremely stressful reactions in survivors. From the many Child Survivors I have encountered who are still struggling with their past, I can recount the following basic impressions in the proceeding section. Delayed Tears — The purpose of this book series was to allow victims to write about their experiences. As the editor of these publications however, I experienced many delays from contributors. Why was this the case? Often, though survivors intended to submit pieces, I would often hear that they had, “broke out in tears,” and that, “the past just overwhelmed” them. Furthermore illness, depression, and fatigue also further impeded their work. Yet the motivation to write was still strong, and contributions did finally arrive, often after more than a year of delays. The first volume of the series was published despite these difficulties. These efforts stir up raw emotions and bad memories, but we publish our stories, and thus instill in survivors a feeling of some satisfaction. Triggers from Everyday Objects — Everyday objects can at times trigger unexpected, intense negative responses from survivors. For example, one survivor in a home refused to shower, and instead insisted on bathing. The nurses at the home at first refused to allow her to do so, and the survivor was unable to explain her unwillingness to use the shower. It was not until an experienced and insightful caretaker, who was herself a second-generation survivor, spoke with her that it became clear that the showerhead reminded the survivor of her experiences in Auschwitz. The reason for the survivor’s reaction thus became clear. Insensitive Behavior — Survivors can at times experience callous or insensitive reactions to their traumatic experiences. One nurse, while caring for a patient, saw the number tattooed across the arm of the survivor and happily commented, “how practical, you got your phone number tattooed right there.” The survivor became numb, pale, and mentally froze. She faintly protested and totally withdrew into herself. From that point forward, the survivor cried and protested whenever the nurse approached her. The administration dismissed the incident and demanded that the survivor should have been amused by the nurse’s comments. They advised that she be less sensitive. Lifelong Emotional Trauma — Often the trauma of childhood experiences continues to impact the lives of survivors decades after the initial event. For example, Salomea Genin, was six years old in 1939 when she first witnessed Nazi atrocities whilst growing up in Berlin. Unable to comprehend events happening around her, her situation worsened after the deportation of her mother. Lacking any form of emotional support or guidance, she sank into extreme depression which continued decades into her adult years. In order to process her experiences and emotional trauma she wrote the history of her family in her book, Shayndl & Salomea: From Lemburg to Berlin. Torture — One survivor, Sara Bialas testified to witnessing the selection of sixteen young girls for gynecological experiments when she was in a concentration camp. Six of the girls suffered a complete mental breakdown, only one girl from the original group was ever able to become pregnant. Sara herself survived being tortured in the camp and speaks about her experiences to school classes. In her talks she tries to focus on themes that are appropriate for younger audiences. She discusses for example what it was like for her to lose her family and home. From Sara Bialas’s speaking engagements with younger students, one educator, Karin Weimann developed a guide on how to prepare classes for contemporary witnesses to tragedy to help facilitate similar opportunities for students. Denial — Survivors have, upon returning home experienced incredulousness and disbelief when they attempt to tell about their experiences. Hans Frankenthal believed that he would be welcomed “home “after he survived the war at age nineteen. When he arrived at his village of Schmallenberg in the summer of 1945, after having survived five years in Auschwitz, Monowitz, and Theresienstadt; he was shocked to find that his neighbors showed little empathy or interest in his experiences. Though he eventually integrated into local life in Germany, he one day, at a sports club, encountered members discussing their ‘heroic’ experiences during the war. When his turn came, he told them that he had been imprisoned in a concentration camp. They disputed his claim, telling him that such horrible stories were impossible, and that he should stop telling such disgraceful lies. Hans died in 1999. His account reveals the enduring impact of the Holocaust, and the long and difficult path towards establishing a wider knowledge of the genocide. Post-war Racism — In the post-war years, Horst Selbiger, a founding and honorary member of the CSD, applied to the courts for modest compensation for the chronic illnesses he suffered because of his time as a forced laborer. The deciding judge in the case stated that his illness was not in fact caused by his persecution, but by the, “generally bad genes of the Jewish race.” The judge was not held accountable for his racist statements. Furthermore, German Chancellor Konrad Adenauer enacted Article no. 131, which re-instated many high-ranking fascist officers to their former governmental positions. Consequently, Selbiger faced continued mistreatment even in the post-war years, as is revealed in greater detail in this series. Second Generation in Turmoil — At its founding, the CSD originally included second generation Holocaust survivors, but tensions between first and second-generation survivors soon arose. In 2015 a second-generation survivor group, of roughly thirty members was formed. They meet monthly and discuss the ways in which their own lives have been impacted by the experiences of the survivor generation. They acknowledge that they lead a stressful life. This is often due to the inexperience of their parents, who lacked proper family support in raising them, the psychological and physical damage their parents endured as a result of their experiences, and the fact that many of them were ‘over-protected’ as children. Very few were raised in fully functioning or healthy environments, and often faced extreme scrutiny or baseless accusations over minor issues. One daughter for example returned to her parent’s home slightly later than expected when she went out dancing. Upon returning home she faced intense reproach from her parents and then complete silence. The parent’s over reaction was thus related to an exaggerated sense of danger and fear, brought on by their past experiences. The trauma faced by survivors thus continues to impact the later generations in insidious and often damaging ways. Withholding the Worst — As an editor of survivor testimonies, I have received written reports in which the authors intentionally exclude the most striking or disturbing facts related to their experiences. In part they withhold these details because of an uncertainty over how their audience will react. They believe that even the public may be reluctant to hear this information. For example, discussing crimes, which occurred after 1945 can prove incredibly contentious, and public agencies at times are prone to cover up such crimes rather than reveal the continuation of post-war violence. As a result, child survivors at times find it impossible to fully and accurately impart the entirety of their experiences. Alternatively, when a survivor experiences a highly personal traumatic event, this can contribute to an inability to publicly share their experiences. For example, one survivor’s son was hospitalized after being severely beaten by neo-Nazis. As a child of a second-generation survivor had wanted to “avoid being timid” when provoked by the right-wing extremist group, and proudly assert his Jewish identity. Though the culprits were caught they received only a minor punishment. The survivor parent could hardly speak, much less deliver a public statement about this traumatic episode. An Incomplete History – Professor Wladimir Solonari (University of Central Florida) states that it is important to understand that the stories of the Holocaust from survivors are fundamentally misleading. By their very nature survivor testimonies are exclusively from survivors, or from those who survived the horrors of the Holocaust. These stories continue onto liberation and beyond the war. The stories that exist from those who perished in the Holocaust are fundamentally different, and remain untold. Stories of survival are atypical cases given that roughly sixty percent of the European Jewish population perished in the Holocaust. This exceptionalism is especially true for survivors of Eastern Europe, where the chances of survival were particularly low. Dismissed for Decades — For decades the experiences of child survivors were dismissed because it was assumed that their youth insulated them from both a clear understanding of events, and the extreme effects of the physical hardships they suffered. Yet in recent decades attitudes towards their experiences have become more accepting. There is now an acknowledgement of the harmful impact of their experiences on their health, identity, career, and family development. Additionally, it is now understood that older child survivors born in the 1930s did possess a deep understanding of the political fascist crimes, injustices, and terror, which surrounded them. For decades the ‘silent cries’ of survivors remained unheard and misunderstood, and, as previously noted, this lack of understanding only worsened the suffering of this group. My Own Experiences as Example — In 1945, as a child of only six years old, I already knew that something was terribly wrong. This uncertainty has shaped and impacted the whole of my life. As a child of a “mixed-marriage” (my mother was of Jewish origin), I survived the war. The Nazis pressured my parents to divorce—if this had occurred my mother, older brother, and I would have been murdered. By mid-1944 my mother was aware of the fate of her brother, Albert. He had been killed with his wife and three children at Auschwitz. At the same time, her sister Hanna was at risk every day of being discovered and hid at various locations in Berlin. The Nazis threatened my father, telling him that he would be forced to join a suicide mission if he remained married to my mother. If he died our whole family would have been deported. Out of desperation my mother committed suicide in 1944 in order to give her children and husband a chance to survive. After the death of my mother, my father was pressured into remarrying an Aryan woman. He did so in order to give my brother and me the best chance for survival. Unfortunately, at the young age of five, no one attempted to explain this tragic event to me. The adults in my life informed me only that my mother was ill, and that I was not allowed to see her. On the day of her death, our family doctor visited our home with a very serious face and then left. I waited at the bottom of the stairs for news and would scream if an adult tried to move me to my bed. After a long time, I was finally told to “say goodbye” to my mother. I stumbled up the stairs and was thrust at her bedside, so I could grab her unresponsive cold hand for a moment, before being pushed out of the room and down the stairs again. At the time, I believed that if I had only been allowed to hold her hand sooner, I could have prevented her death. Though I could not fully grasp the situation at the time, I remember my mother’s death and my own sense of helplessness and total confusion. After being told, “your mother went away,” my reply was, “why did she not take me along?” My question was met with confusion and silence. One day a relation of mine who was only a teenager glowered at me, and said, “You should never have been born!” I was stunned and asked why. The only answer I received was that I was too young to understand. This lack of clarity typified my childhood. Years later I learned that my Aryan stepmother had had, “difficulties” with me. She was by no means fascist but was only interested in her own children. I became an unwanted guest in my own home. After my mother’s death I was alone all day in my room and hid myself under the heavy covers of my bed. I was neglected, and my behavior grew erratic. At the age of sixteen I began to understand the importance of education, but I continued to exhibit behavior problems related to my early trauma. This impacted my ability to secure a job and establish my life. Though I realize that the fate of a child from a “mixed marriage” was mild in comparison to the sufferings of those interned in concentration camps and ghettos, my life was impacted by the trauma of my childhood, and the death of my mother. I carry these scars with me even today. Continuing Battles Against Fascism into the Present Day — The current challenge to combat fascism makes us continually alert to dangers. Society remains limited in its readiness to combat far-right wing movements; understanding the experiences of survivors and the impact of genocide and racism remains an ongoing process. Our organization attempts to challenge the rise of neo-fascism and neo-Nazism through a dedicated effort to educate the public about the continued horrors of these movements in all its many forms. In Germany, even seventy-three years after the Holocaust, survivors face continued antisemitism, ambivalence, ignorance, and a refusal to acknowledge the trauma we endured. Though the situation has improved in recent years, as child survivors have experienced growing interest in and respect for their experiences, we are unable to unburden ourselves from our enduring trauma. Coping with current antisemitism poses a challenge for many survivors and adds an additional layer of stress and concern for them. For example, in 2013 and 2014, I organized the 26th annual meeting of the WFJCSH&D with Max Arpels Lezer, which was to be held in Berlin. Throughout the planning process I was inundated with questions from participants regarding whether or not they, as a survivor, would be safe in Berlin. Max and I took care to ensure that precautions for the meeting were taken, and we advised participants to not wear a kippah in town. Though no one was attacked, in 2014 there were a rash of antisemitic incidents: an antisemitic agitator assaulted a man wearing a kippah with a whip while onlookers failed to intervene; a rabbi and his daughter were attacked on the street; Jewish cemeteries were vandalized with swastikas; and Jewish children were attacked at school. Yet our response has not been one of passivity. On 25 April 2018, there was a well-publicized demonstration of the wearing of kippahs with both Jewish and German agencies participating. In addition, we are strategically seeking to increase our online presence through our CSD website: http://www.child-survivors-deutschland.de/. Through these publications we attempt to deal in different ways with the diverse experiences of child survivors within the complexities of German society. Our goals are both to communicate these experiences intelligibly to audiences unfamiliar with our history and the difficulties we face, and to also create solidarity amongst child survivors within Germany and beyond. In the following section of this article, I will briefly discuss these volumes. Bitter Past! — Better Future? Bittere Vergangenheit! — Bessere Zukunft? Volume one of this series includes a collection of stories and reflections from several child survivors who endured Nazi persecution as children until 1945. The experiences of every survivor are unique, though experiences of Jewish child survivors in Germany, are particularly exceptional. This group is comprised of those whose parents chose to remain, as well as those who immigrated to Germany in later years, including many survivors from Poland. 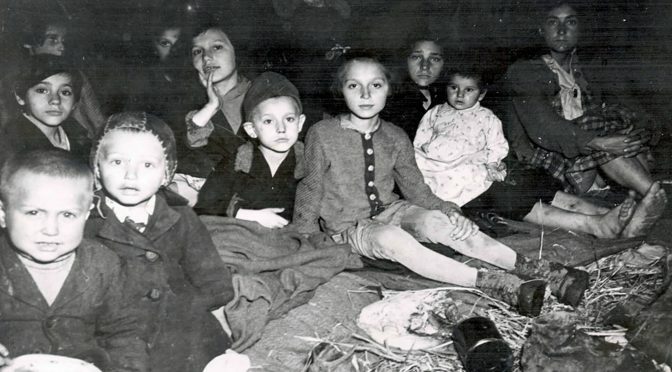 Children of parents who chose to stay after 1945, often faced disbelief that their family, as Jews, would wish to stay in the country of the perpetrators. Yet the choice to stay was a complex one. Individuals who remained often wished to maintain their ties to hometowns, familiar people, jobs, and habits, even in spite of potential conflicts and tensions. Throughout Europe as a whole fascist and far right-wing movements emerged shortly after 1945, and survivors who remained, confronted these realities. In the decades following the war, Jews were widely ignored, and remained on the margins of German society. The long-term impact of the Holocaust has continued into the postwar decades. More than seventy years after the end of the Holocaust, child survivors continue to manage and struggle with the effects of their trauma. Conflicts emerge not only externally with society at large, but also internally within families including amongst second, third, and even fourth generation descendants. This volume explores the unique difficulties child survivors experience. Often times, as child survivors we ask ourselves, “Are we especially nervous, wounded, or traumatized compared to others who have experienced traumatic events?” We are thus left wondering if the uniqueness of the Holocaust has in turn created a unique trauma, with which we must cope. Past memories always threaten to come into the forefront of our experiences. Given the rise of far right-wing groups, the post-Holocaust society of Germany offers an ambivalent message for the future. As child survivors, these tensions only serve to further trigger our memories and anxieties, thus causing our past trauma to impact us in the present. When our group, The Association of Child Survivors in Germany (CSD), formed, we sought to promote a greater social understanding of the Holocaust. We consciously chose to avoid constructing any ‘hierarchy of suffering,’ by which to measure one child survivor’s experiences as more burdensome or traumatic than that of another. We understood that every individual’s fate was unique and different, and there are enormous differences in intensity and amount of suffering. But we also understood, that any form of competition was a counter-productive form of communication. All of us had been ignored by society and possessed a similar shared experience. Though we still have not yet come to terms with our traumatic pasts, we have made significant strides in improving the bonds we have formed, and the way in which we communicate with each other. With respect to our own ability to speak about our past and current traumas, our group has depended upon support from professional therapists. In the present day the Holocaust continues to have a destructive impact upon our physical health, education, careers, and our ability to maintain stable healthy relationships with others, and even amongst members of our own family. It is the aim of our group to ensure that our past tragedies and current sufferings are better understood and respected amidst the wider public. Yet our organization has found it increasingly difficult to find funding to support our projects and ongoing initiatives. This is even in spite of the fact that the German government currently provides hundreds of millions of Euro to support medical care for survivors, and to fund public memorialization and education initiatives. This support however has produced a negative backlash in the wider public’s perception as, forty percent of youth in Germany believe that, “Jews use the Holocaust to gain financial advantages.” In reality the compensation we have received from the government has been modest in comparison to the economic, emotional, and familial losses our community endured. We have thus concluded that the rise of antisemitic thinking is due to a lack of knowledge and understanding of our history and current suffering. This volume also explores other vital issues, such as the recommendations we have for society and politics. For example, it examines the place of Jews in German society, how we, as German Jews may approach Israel and Israeli politics, how survivors can present our stories to children and youths unfamiliar with our history, and how to build relationships with second and third generation descendants. Also, this volume touches upon the current refugee crisis in Germany, and particularly the plight of refugee children from Syria. It examines their mental state, how they have been welcomed into Germany, and the potential impact of their experiences on subsequent generations. The second volume of the series focuses upon Theresienstadt. It tells the fate of Liesel Binzer, a child survivor, and how the Holocaust impacted her and her family both before and after 1945. The volume describes Binzer’s experiences in Theresienstadt, her later life as a mother of three children, her later work in a finance office, and her current work visiting schools to bear witness to the Holocaust. Three generations of Binzer’s family are included in the volume, and contribute in varying ways. Her story reveals how the complexity of her experiences continue to have a remarkable and enduring impact on her life. I grew up as an adult much too early in Theresienstadt and I still miss my lost childhood…I never got rid of my inner restlessness, my nervous readiness for danger—even in my now, by and large, peaceful surroundings. My living will has always been challenged, and then strengthened…I am always especially alert with regard to anti-Semitism…I have a never ending drive to warn society, particularly in view of injustice, and the necessity to fight it in all its evil forms…What I would love to experience and enjoy, is simply a peaceful and relaxed world and mood, interrupted only occasionally by real danger, that would need my response. The story of her life, her message, and her work holds a straightforward and reflective message, that appeals to us all; young and old. In this volume experts from different fields discuss the varying attitudes, achievements, and problems faced by child survivors today. Experts in the field of psychology describe post-traumatic stress disorder, which manifests in the form of extreme alertness, excitability, irascibility, irritability, enhanced distrust, suspiciousness, and an inability to form healthy relationships. For elderly child survivors, often in poor health, this volume includes advice on how to establish a safe environment, cope with challenging situations, and establish more control over their own decision-making process. Child survivors suffering from post-traumatic stress disorder must cope with renewed tensions and stress with the rise of far-right wing groups. For example, in 2011, during the last election campaign, the neo-Nazi NPD party put up posters throughout Berlin with the wording, “Gas geben.” Though this was a clear provocation and allusion to the murder of Jews during the Holocaust, the NPD claimed that it was an innocuous reference to riding a motorbike. Despite protests against the poster, the NPD won its case in the courts. Similar provocations have come from the far-right wing AfD (Alternative for Germany) party, which continues to grow in popularity. A shift toward a more resilient democracy is possible, but by no means guaranteed without an awareness of these issues by the wider German society. Given the current political climate, child survivors struggle to cope with such provocations. We react with more intensity than others to these attacks due to our experiences and lingering trauma. Our environment is thus at times a mixture of friendly and hostile surroundings, which keep us in a constant state of stress, anxiety, and wariness. These factors in turn impact our children and family, producing an unstable and frustrating situation at home and in public. These issues remain unavoidable as child survivors, and we require reassurance and support, and to find and maintain a respected role in society. In part, child survivors have achieved a level of acceptance and inclusion in German society that is today better than it has ever been in the past. The current president of the Central Council of Jews, Josef Schuster, has correctly stated that Jews now in Germany have better options available to them than ever before. Empathy towards our history and our experiences has improved considerably over the past few decades. This volume is a 72-page booklet, which contains excerpts from a lengthier document describing the fate of child survivors who emigrated from the former Soviet Union to Germany. We published the full detailed report as part of another book series, see below Volume 3: Injured Childhood.” This shorter volume is intended for students, teachers, and politicians, as it contains a condensed version of the original text’s essential findings and is, in this condensed form, more accessible to readers unfamiliar with this history. Child and second-generation survivors have written extensively about their experiences and emotional struggles. Their writings have expressed their frustrations with German society in previous decades and in the present day, and have also expressed their hope for and belief in building a better future. Volume one of this series explores a wide range of these emotions, aspirations, hopes, and disappointments through a collection of writings by child survivors and descendants. Their individual struggles to cope with their past traumas while still maintaining their everyday lives speaks to their impressive resilience. The volume explores the enduring psychological impact of the Holocaust on child survivors, as revealed through one article from a survivor expressing their feelings of helplessness and bitterness after enduring a lack of understanding from others. There appear again and again many variations of such stories, testifying to the destructive corrosive effect of the Holocaust on the lives, and psychological and spiritual health of survivors. This trauma permeates into the second generation, who though not directly impacted by the Holocaust, nonetheless suffered as a result of their parents’ trauma. Such accounts stand as important evidence of the enduring emotional impact of the Holocaust on child survivors and subsequent generations. The pain of this trauma thus endures and can be felt even in old age. On 27 January, the anniversary of the liberation of Auschwitz, the Ruth-Cohn-School in Berlin invited survivors to visit a class and tell students about their experiences. Eight members of the CSD were present that year. Karin Weimann, an educator at the school, and contact for our organization, provides a vivid description of these dramatic encounters. Weimann and her colleagues aptly prepared their students for this visit, and successfully fostered an open and understanding environment. Through these visits an enduring friendship developed between Karin Weimann and one of our members Sara Bialas, a survivor of the concentration camp Gross-Rosen in Silesia, Poland. The students respectfully listened to Sara’s story with interest. Though these younger students were not told explicit or graphic details of her experiences, they comprehended the fundamental tragedy of the Holocaust, and reflected on what it would mean to lose one’s entirely family as Sara had. Most importantly, students were taught that it is not the responsibility of one single generation or group, but rather everyone to ensure that such tragedies do not happen again. Weimann’s text provides a systematic and comprehensive strategy for organizing such events, and thus functions as a defacto handbook for educators and schools to coordinate similar events with child survivors. While there exists a wealth of documentation on the Holocaust in countries such as Poland for example, there however remains much less that is known about the scale of the terror further east. Volume three in this series explores the details of this history through child survivors who emigrated from these regions to Germany after the fall of the Soviet Union. These accounts reveal many frustrations from 1945 until the collapse of the USSR under Gorbachev. After 1990 more than 200,000 Jewish refugees migrated to Germany from the former Soviet Union states of Belarus, Estonia, Latvia, Lithuania, Moldova, Ukraine, and Russia. As a result, a large Russian-speaking Jewish immigrant population formed in Germany. Roughly one thousand were child survivors and in 2006 they founded their own association of post-Soviet child survivors. This volume explores how methods of mass murder in this region differed from what took place in Auschwitz. For example, those interned in camps in the former Soviet Union were isolated in winter, and denied basic food and shelter. Local pogroms had occurred even before the arrival of the Nazis. After the end of the Holocaust, antisemitism continued in both the government administration and the wider society. Child survivors thus found little to no respite in the postwar, years, but rather a continuation of poor and hazardous conditions that at times proved deadly. Post-Soviet child survivors who emigrated to Germany after 1990 began new lives. Often times this group was subject to harassment from the German administration and suffered continued economic hardship. This brought forth memories of previous abuse, yet as one testimony from this volume mentions, even these conditions in Germany were an improvement when compared to their lives in the former Soviet Union. This younger contingent of child survivors, and the second generation of survivors have been dedicated to establishing new lives in Germany. Their efforts have been met with often impressive degrees of success with many achieving high academic standing. In this volume, a story of a child survivor is explored. Fred survived as child in a mixed marriage (father was Jewish). He survived many dangerous incidents, and was a witness to the persecution of Jews in Berlin, and also bombings of Berlin. In recent years, Fred was a fighter for democracy. He died very short before his book was printed. There is a wealth of diverse artwork made by child survivors and their descendants. This planned future volume shall explore these works, their significance, and the role they plan in the lives of child survivors. In addition, it will explore aspects of ‘creative life’ in the everyday activities of survivors. Furthermore, we have several biographies in our archives, which we plan to publish, as well as several studies on the reactions of child survivors to ongoing societal changes in Germany. Our association, Child Survivors Deutschland, cares for the emotional well-being of its members. In doing so we identify and put forth recommendations for changes within German society. Our group consists primarily of individuals over seventy-three years of age, though most of us are over eighty. For assisting us with funding the start of our book series, we are sincerely grateful to the BMG (Ministry of Health), Conference on Jewish Material Claims Against Germany (Claims Conference), EVZ Foundation (Erinnerung, Verantwortung, Zukunft – Remembrance, Responsibility, Future), and Zdj (Zentralrat der Juden in Deutschland or Central Council of Jews in Germany). We could not have applied for this funding without the continued commitment of our members, and the support we receive from dedicated family members. We recognize that the German Government does acknowledge its historical responsibility for the Holocaust and has established a special relationship with and duty towards the state of Israel, as well as the wider Jewish diaspora. The official stance of the Foreign Ministry is clear in its obligations towards our community and we are pleased to recognize this support. The German Government officially works to promote Jewish life in Germany and beyond, and the Foreign Ministry has provided excellent help engaging directly with the 2014 CSD project for the global world conference of Child survivors (WFJCSH&D). There are many positive initiatives that have appeared in recent years, which are encouraging. For example, the German Historical Museum’s exhibition “Diversity Destroyed” held in Berlin in 2013, presented the public with overwhelming evidence of the positive contributions of the Jewish population to German society prior to 1933. Integrating more than forty museum, memorial and private collections that displayed the history of Berlin under National Socialism, the exhibition included temporary art projects, theatre performances, readings, film projects and audio guides. Documenting the disastrous consequences of the Nazi dictatorship to Berlin, the exhibition successfully demonstrated the negative impact of Nazism to both Jewish and non-Jewish Germans alike. The installation of public educational efforts such as these provide a more hopeful outlook for the future of Jewish life in Germany. The CSD attempts to contribute to the restoration of and maintenance of Jewish-German relations. Such activities as the global WFJCSHD conference in 2014 demonstrate signs of understanding, compassion, care, cooperation, and support from both the German government and the public. It is imperative however that we do not take integration of the Jewish community in Germany for granted. Though we cannot restore our lost childhoods, we seek to ensure that we do not suffer injustice, fascism, or the violation of human rights in our old age. We never waver in our dedication and hope for a better future. Dr. rer. nat. Philipp Sonntag is a board member and treasurer of the German Child Survivors. He studied physics, and Political Science. In addition to being a prolific author in his field he has, since 2007 published several works on the experiences of child survivors. A portion of this book series was funded by the foundation, Erinnerung, Verantwortung, Zukunft — Remembrance, Responsibility, Future (EVZ), and the Central Council of Jews in German (ZDJ). Salomea Genin, Shayndl and Salomea: From Lemberg to Berlin (Evanston, IL: Northwestern University Press, 1997). Hans Frankenthal, The Unwelcome One: Returning Home from Auschwitz (Evanston, IL: Northwestern University Press, 2003). Horst Selbiger, Verfemt – Verfolgt – Verraten: Abriss meines Lebens (Baunach: Spurbuchverlag, 2018). This volume has been supported by the German „Initiative January 27th” For a condensed version of this text please see volume 4 of our book series at Hentrich & Hentrich. Deutschlands Bundesassoziation der Holocaustüberlebenden – Immigranten aus den postsowjetischen Staaten e. V. (Association of Holocaust Survivors in Germany – immigrants from the countries that before had been part of the Soviet Empire in Eastern Europe). President Dr. Alexej Heistver www.holocaustonline.de.